Hand bikes are available at many gyms. 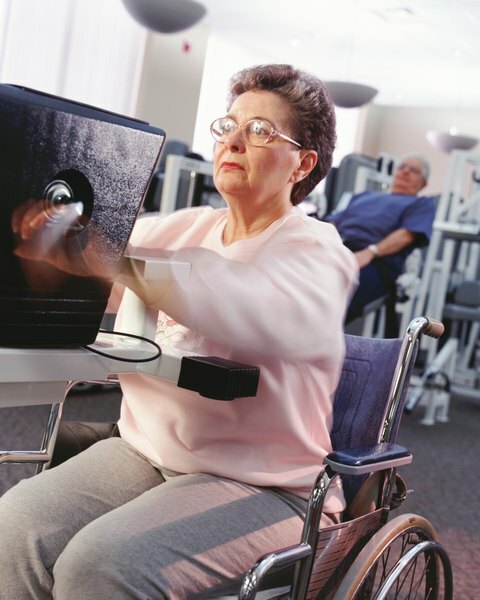 Just because you are wheelchair-bound doesn't mean you can't stay fit. Cardio workouts with your arms can be extremely effective in increasing your heart rate, while dumbbells, bands and even barbells can be used for resistance training. Just like everyone else, you should try to to fit in at least 150 minutes of moderate activity each week along with two to three days of resistance training. Chair dance to music. Pump your arms, wave them in the air and move your hips, if you are able. You can do your own routine to your favorite music, exercise along with the many DVDs available or find something online, such as the National Center for Physical Activity and Disability's YouTube video for teens with spina bifida. If you find 30 minutes of straight cardio too challenging, break it into 15-minute intervals. Box using a light mobile punching bag, or if you don't want to get into the glove thing, box along with a DVD or video game system. You can also just punch the air or fake box with a friend. In addition to aerobic exercise, boxing can relieve stress. Wheel a manual chair. An article by professor David R. Bassett Jr. of the Department of Kinesiology, Recreation and Sport Studies at the University of Tennessee in Knoxville states that wheeling a manual chair on a flat surface at about 2 mph would burn as much as 120 calories in a half-hour for a 160-pound man. As a point of reference, using the ExRx.net Calories Burned Calculator, someone of the same weight walking at 2 mph for 30 minutes would burn only 112 calories. Pedal a hand bike or upper body ergometer. As the name states, these are machines you pedal with your hands. They are available at many gyms and YMCAs. Table-top models are also available for purchase. Wrap a resistance band around your back to work your pecs. The band should be at a level so that the loose ends are at chest level. This means wrapping around your back just about under your bra. Take the ends of the band in your fists with your palms facing down, making sure both sides are even. Your bent elbows will be out to your sides at chest level. Keeping your wrists straight, extend your arms out against the resistance of the band and slowly return to the starting position. Work your upper back area by extending your arms in front of you just a little below shoulder level. Hold the band in both hands, starting with your hands about shoulder-width apart. With your elbows slightly bent, stretch the band while pulling your shoulder blades together. Control the return to the starting position. Loop a band under the footrests of your chair, if you can. If this is too difficult, use hand weights or dumbbells. Hold the ends of the band -- or the weights -- with your palms facing in and, if you can, hold your arms inside the arms of your chair, close into your body. If you can't do that in your chair, rest your forearms along the arms of you chair. Pull the weights or the ends of the band up toward your shoulders and slowly return to the starting position. This works your biceps. Crunch your abs. Place your fingertips lightly on the top of your head with your elbows pointing forward. Start with your back flat against the back of your chair. Inhale, then exhale slowly and fully as you bring your elbows down toward your lap. Concentrate on contracting your abdominals, pulling the area between your chest and your navel toward your backbone. Add resistance by placing an exercise band just above your knees with a short grip on either side of your legs. With your arms extended but your elbows soft, do your crunch against the resistance of the band. Cardio exercise done with the arms increases the heart rate faster than leg exercise, like walking or running. So asking your non-chair-bound friends to join you will benefit them, too. Do at least one set of eight to 15 repetitions for resistance training. Add reps and sets as you gain strength. Increase band resistance by shortening the band, or buy bands with higher resistance. Chances are your triceps are already pretty strong from transferring to and from your chair, but if not, do triceps dips trying to lift yourself while pushing against the arms of your chair. It's recommended that you reduce your target heart rate by 10 beats per minute for arm exercise. Consult your physician before beginning an exercise program.